The shoe industry has an annual value of $32 billion. With declines seen in sales the last few years from weakened consumer purchasing, the shoe industry has seen recent growth the last two years since then. Mainly focused on competitive pricing and mass merchandisers, specialty shoe stores tend to focus on exclusive shoe styles. A series of shoe slogans are outlined below from current shoe manufacturers worldwide, with an intent to brand their products. A difference you can feel in your sole. A life full of spirit. A moment of your style. A new line of creativity. A new tale of every shoe. A new walk of life. A power that runs you. A sole brand to remember. Adorn your feet with best. Beauty treatment for your feet. Best shoes, for best style. Better little shoes are not made. Desire the feel of satisfaction. Don’t Wear It. Use It. Don’t get left behind, wear ____ shoes. Dye your shoe with nature. Finiest footwear for finest peoples. Get a new leap of comfortable. Get a new swing of life. Get lighter for tougher move. Get more miles for your shoes. Get the true power of comfortable. Give value to you feet. Giving value to your feet. Good footing for good life. Heres to the brave girls. If the boot fits wear it. Imagine the best in every shoe. In your sole, you know we’re better. It’s smart to be practical. Make it better for feet. Move ahead of your mark. New stuff for a new dream. Performance Is In Our Sole. Put your best feet forward. Put your spin on it. See how good they feel. Shoes are a part of your life. Shoes designed to move you. Shoes for the whole world. Shoes that are lighter than air. Shoes that work for you. Shoes you can live in. Stay on in tough situation. Taste the thrill of adventure. The Baby shoes that Stay On! The finest Footwear for the Active lifestyle. The Finest Walking Shoes On Earth. The well designed shoe community. The world under your feet. Think! Healthy shoes. Naturally beautiful. Treat your self with a new shoes. Two feet ahead of the rest. Walk, Jog, Run, Sprint, Bolt. We only know two things, feet. When you’re on your foot all day. Worn by the world’s most precious feet. Shoes are normally built for style and trends, not necessarily comfort. 42% of women admit to wearing a shoe they liked even if it provided them discomfort. 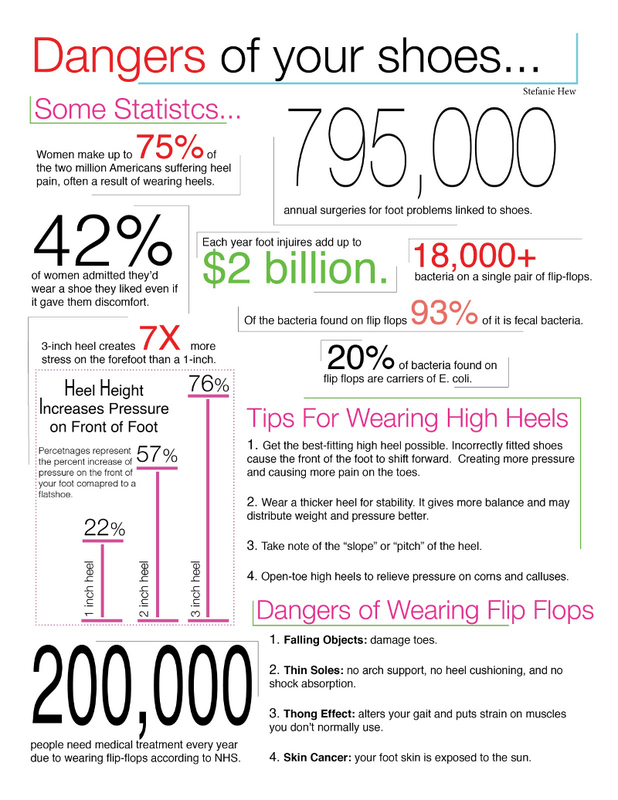 The infographic posted below outlines interests facts about shoes.